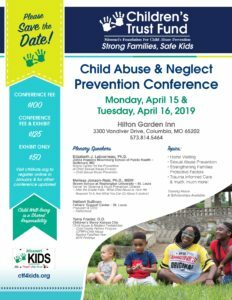 Prevention Conference scheduled Monday, April 15 and Tuesday, April 16, 2019 at Hilton Garden Inn, 3300 Vandiver Drive, in Columbia, Missouri. We hope to see you, and we look forward to another great conference! Thank you! Online Registration Now Available! Click the REGISTER button below to get started … thank you! *Please make your reservation by Wednesday, March 27, 2019 to ensure the rate. *Fee includes all conference materials, workshops, general sessions, refreshment breaks, one continental breakfast & one lunch. *Please include payment with your registration. *There will be no cancellation refunds after Monday, April 8, 2019. *Please complete one online Registration for each person attending. Monday, April 15, 2019: 9 a.m. – 5 p.m.
Tuesday, April 16, 2019: 8 a.m. – 11:15 a.m.
Break-out Sessions 11:15 a.m.-12:30 p.m. The Missouri Children’s Trust Fund (CTF) works to strengthen families and prevent child abuse and neglect through grant distribution, education, awareness and partnerships. 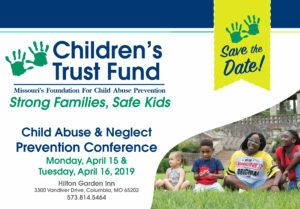 CTF is pleased to open this Call for Proposals for its bi-annual Child Abuse Prevention Conference scheduled Monday, April 15 and Tuesday, April 16, 2019 at the Hilton Garden Inn in Columbia, Missouri. The conference serves to facilitate opportunities for participants to network, share and learn about #StrongFamiliesSafeKids. CTF is interested in a wide scope of topics associated with strengthening families and preventing child maltreatment for workshop sessions 1 1/2 hours in length. Submissions for consideration are invited from qualified organizations and individuals from a variety of backgrounds and experiences. CTF expects approximately 250 attendees from child and family serving organizations across Missouri. Each presenter shall receive a free conference registration, lodging and paid travel expenses as necessary and as funds are available. The Call for Proposals received shall be reviewed following the Tuesday, June 5, 2018 submission deadline. For further information, please visit ctf4kids.org or contact CTF at 573.751.5147 or ctf@oa.mo.gov. Thank you for your interest!